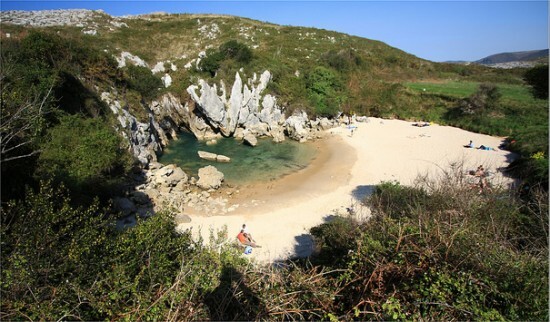 Tucked away into a small inland hollow, right in the middle of a meadow, Playa de Gulpiyuri is one of the most amazing beaches in the world. We’ve certainly featured some unique places here, on Info by Wahyudi, and even a few incredible beaches, like the hot water beach of New Zealand or California’s glass beach, but none like the beach of Gulpiyuri. 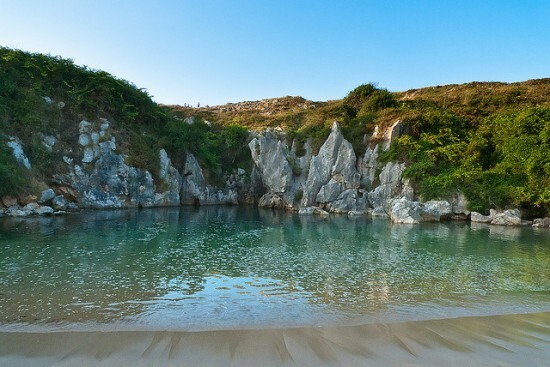 Located near the charming town of Llanes, on the northern coast of Spain, Gulpiyuri Beach is unlike anything I have ever seen, or even imagined existed outside of fantasy books or fictional planets. Imagine walking over 100 meters from the sea shoreline and stumbling over a small charming beach right in the middle of a green meadow. And while you may find other beaches completely hidden from the open sea, around the world, this one is actually fully tidal and even has waves bathing the small strip of golden sand. So how is it that waves form this far away from the ocean? 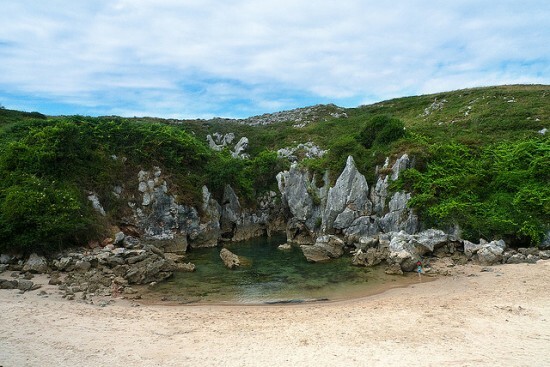 It appears the salt waters of the Cantabrian Sea bored through the earth, creating a series of underground tunnels that now feed fresh water to Gulpiyuri Beach. 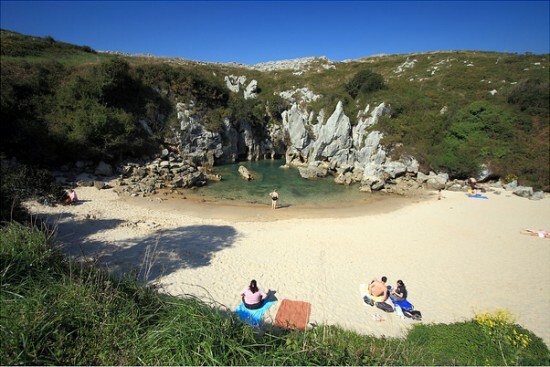 Water from the nearby Bay of Biscay comes in through the underground tunnel network and washes up on Gulpiyuri in gentle waves, adding to the charm of this magical cove. The shallow crystal clear water of this place acts as a swimming invitation that cannot be refused, but you may find it a little cold, because the water tends to remain underground for a while, before washing into Gulpiyuri Beach. Because it’s only 40 meters in length, and outside viewing range from the shoreline, Playa de Gulpiyuri can be pretty hard to find, unless you have an updated GPS map or ask for directions from the locals. Even so, it’s best to avoid visiting it on weekends, when the beach is simply inundated by tourists from all around the world.